Every time you update your MyCarletonOne password you must also update the password stored in all your wireless-attached devices. Important: Failure to update a stored password to your new MyCarletonOne password can result in automatic lock-out due to repeated, unsuccessful log in attempts. 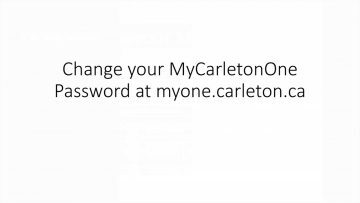 If you do not use your MyCarletonOne password to connect to Carleton’s wireless networks, skip to Step 2. Forget the CU-Wireless or eduroam connections prior to setting up or changing your MyCarletonOne account. This will prevent automatic lock-out due to repeated, unsuccessful log in attempts. Please note: This process can only be done when on-campus. iOS cannot present all saved Wi-Fi networks unless they are within range. Please note: Due to the many versions of Android, the following may not apply to your device. Please note: If at any time you are prompted for your CU-Wireless or eduroam password while following the instructions below, enter your new MyCarletonOne password, and no further action is required. Please note: These instructions apply to the latest version of Mac OS X (10.12.6) using the Mail app (mail.app) configured to connect to Exchange mail at Carleton. If you are having issues with your account log in or password, DO NOT use the form below for support. Instead, contact the ITS Service Desk. The form below is to capture documentation errors on this page. *NOTE*: this form is not for support requests. If you need support contact the ITS Service Desk. This form is to help us improve the content on this page. Please tell us what you were looking for?